​Illumination renders this pizza shop two-dimensional. Hang it like a painting on the wall and it’s sure to offend art theorists like Donald Judd or Robert Smithson, who reject two-dimensional representation and argue that art now requires three dimensions to properly interact with its environment. 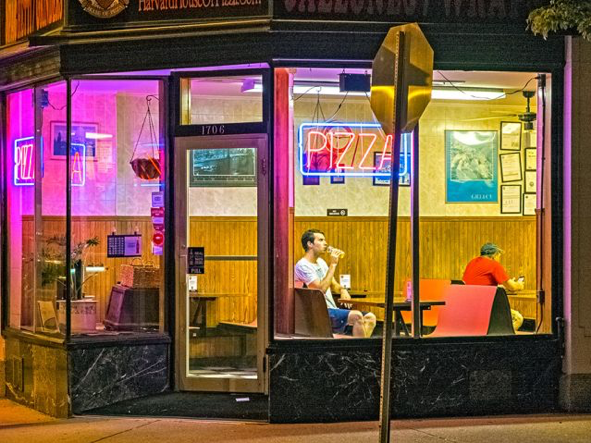 This pizza shop happily interacts with its environment, but the violet glow framing the facade looks more like art than artifice, and the two men seated inside have crept from Edward Hopper paintings to pose. The young man lifts a plastic cup to his lips and sneers into it. The older man, placid in a red shirt, stares into his phone, his baseball cap a bit askew. From out here in the urban dark this shop looks like an island of prismatic evolution. From the violet glow on the glass and window frames through the neon logo to the yellow walls over blond wainscoting, the space defines itself by color rather than form. All straight lines except for the two people. Straight lines flatter the picture plane but deter perspective. Leonardo taught us that. The circumference of a pizza would lend depth to the scene, but it’s still in the oven, plotting with a pepperoni smile.